New Orpington Lodge, later renamed St George's Home, was established in October 1895 on Wellington Street in the Hintonburg district of Ottawa. It acted as a receiving and distributing home for Roman Catholic children being emigrated from the United Kingdom and was run by the Incorporated Society of the Crusade of Rescue, later known as the Catholic Children's Society (Westminster). The home's original name was probably based on the Catholic orphanage at Orpington in Kent. The rented house was 'furnished and fitted up for the reception of fifty children by the generosity of a benefactor' (McEvoy1999). 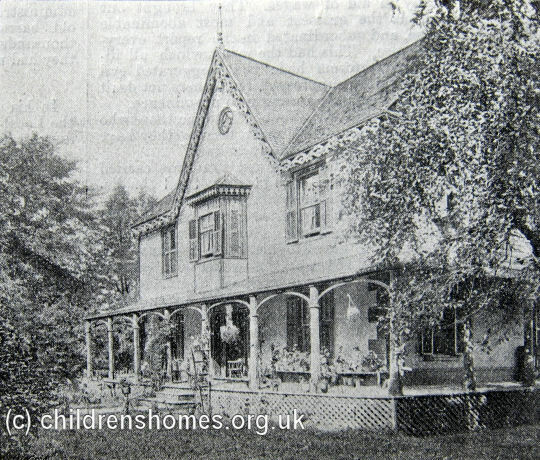 At the end of its first year of operation, the home had received two groups of around thirty children each and the property was then purchased by the Society. A report in May 1904 by a Canadian government inspector made some serious complaints about the home. The entire building was in need of renovation. The boys all slept in a large attic accessed by a narrow staircase which would be a serious hazard in case of fire. The room was unplastered and unfurnished apart from a few camp beds. Most of the boys slept on the floor on worn-out mattresses, covered by a blanket and a quilt, with a pillow without a cover. On a hot night, the room would be 'insufferable'. It was recommended that the home's first-floor office be converted into sleeping apartments. The property was accordingly refitted and at the same time adopted the name of the St George's Home. In October 1907, the running of the home was taken over by a group of five nuns from the Congregation of the Sisters of Charity of St Vincent de Paul, who also ran the Father Hudson's Homes in England. In the period up until 1917, when wartime conditions suspended the emigration of children to Canada, the number passing through the St George's Home totalled around 300. There was a resurgence in emigration after the war, with as many as 400 children a year being placed by the home. This stalled in 1925, however, when new regulations required that only children aged fourteen or over could be admitted to Canada. The Great Depression of the early 1930s also contributed to the decline. The Home closed in around 1934. The property is still owned by the Catholic Church.